Great stuff, Adrian! So you are using silicone sealant instead of Polyfilla now? Were there problems with Polyfilla that made you want to change or are you just trying different materials? With that pressurised plastic kooldrank bottle I'm wondering why you didn't just design it so that you could screw in a standard silicone sealant tube into the extruder. I'd think that that would be the easiest. I was trying to estimate the distance between your support material extruder and your Mk II extruder and got something like 50 mm. Is that about right? To my knowledge, what causes PDMS to set is not a catalyst, but a reactant. Where R is, for bathroom sealant, acetate and, for your tube, probably chlorine. I think the sealant is sold partially polymerized, but the reaction is the same, and a catalyst wouldn't provide the necessary oxygen. Water vapor diffuses through silicone, which is what allows the interior of a bead of caulk to set; I believe it's also diffusing through your tube, and through the plug of set material at the end, as well. 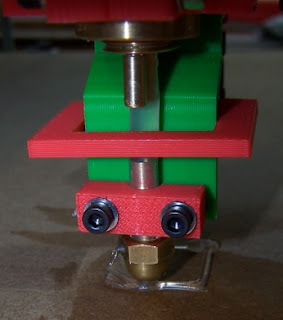 What you might consider is keeping the extruder in a dessicator when not in use. Chemical supply companies sell nice absorbent granules that change color when they're damp, and can be baked dry very easily. Uh, but vinyl tubing might help; I think it forms a fairly good barrier to water. Presumably, the air in the drink bottle dries out before much of the material in the balloon sets; I know polyisoprene is water-permeable. You are keeping it in the bottle, right? The best rubber where permeability is concerned is polybutediene (aka butyl rubber). I'm not sure you can get tubes made from it, but they do make gloves. Goshdarnit, Adrian. That's looking good. I was wondering how the two heads would fit together, and it's good to see them doing so snugly. I just used silicone first because it's fairly easy to handle and I happened to have some. I'll try the Polyfilla later today. 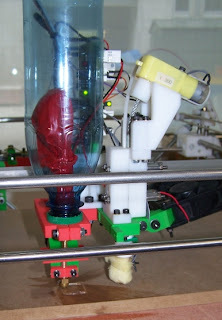 It is using the standard extruder nozzle arrangement more or less. I modified it a bit for this prototype, but a production version would use it unmodified. 50 mm is about right. I'll do a test object which can be measured to put the actual numbers in as offsets in the properties file. Joel's PDMS reaction info is most useful. I was going on the fact that we have a drum of the stuff for moulding that we have to mix 10:1 with a hardner, which I had ignorantly presumed was a polymerisation catalyst. But it is certainly the case that it is water vapour that makes this stuff set (and the acetate gives the usual vinegar bathroom sealant smell). I did know that water can diffuse through the silicone tube. I think if I can find a soft impermeable tube that will fix the problem.